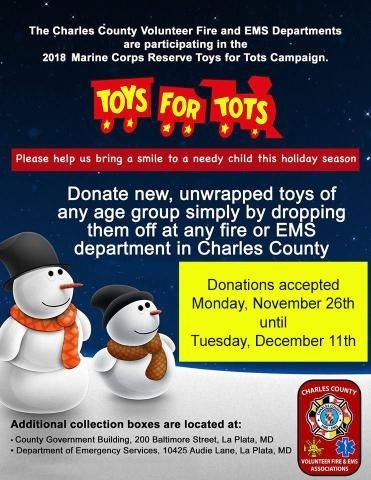 The Nanjemoy Volunteer Fire Department is Pleased to help out with the Toys for Tots program again this year. You can Drop off a New, unwrapped toy at the Nanjemoy Volunteer Fire Department located at 4260 Port Tobacco Road (Intersection of MD. Rt. 6 and Liverpool Point Rd.) Or you can drop off at any Fire Dept. or Rescue Squad in Charles County.